I am always intrigued to see photos of people's pasts on their blog (probably because I'm pretty nosey), so I thought I might make my own 'Flashback Friday' a regular thing. Hopefully I have enough photos - I always worry that I never take enough! So each week from now, I will try to post an old picture or two on a Friday with a little something written about it. If you're a blogger and you do posts like this, please leave a comment of where I can find your Flashback Friday or Throwback Thursday posts - I'd love to see them! So here goes with Flashback Friday numero uno! 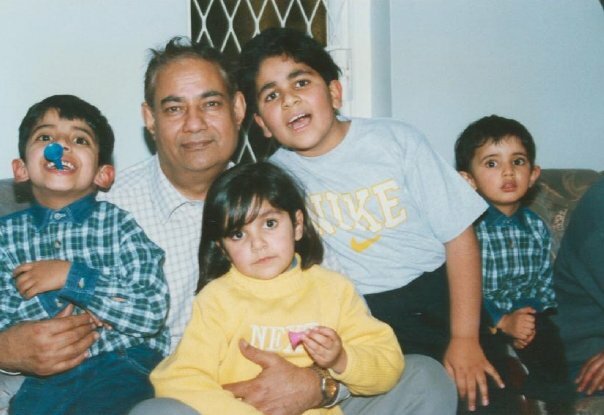 Recognise someone in the yellow jumper? I think I am around 4 years old in this picture. With me is my Grandad (my Dad's Dad) - I call him Bigdad, not sure how that started but the name has stuck! On my immediate left (right if you are looking at the photo) is my big brother Ken, and on either side of me and my brother are two of my cousins. I love looking at pictures like this, everyone has grown up so much!